‘Better late than never’ they always say, and this is most definitely the case with the recap for February’s Recipe Challenge, because it was a good one! I am slightly delayed in posting February’s recipe report because of the food marathon that Adam and I indulged in over the past week while visiting friends in Toronto and Montreal. Needless to say, there are going to be many posts in the near future about all the amazing food we ate, so stay tuned! On to the fun stuff. 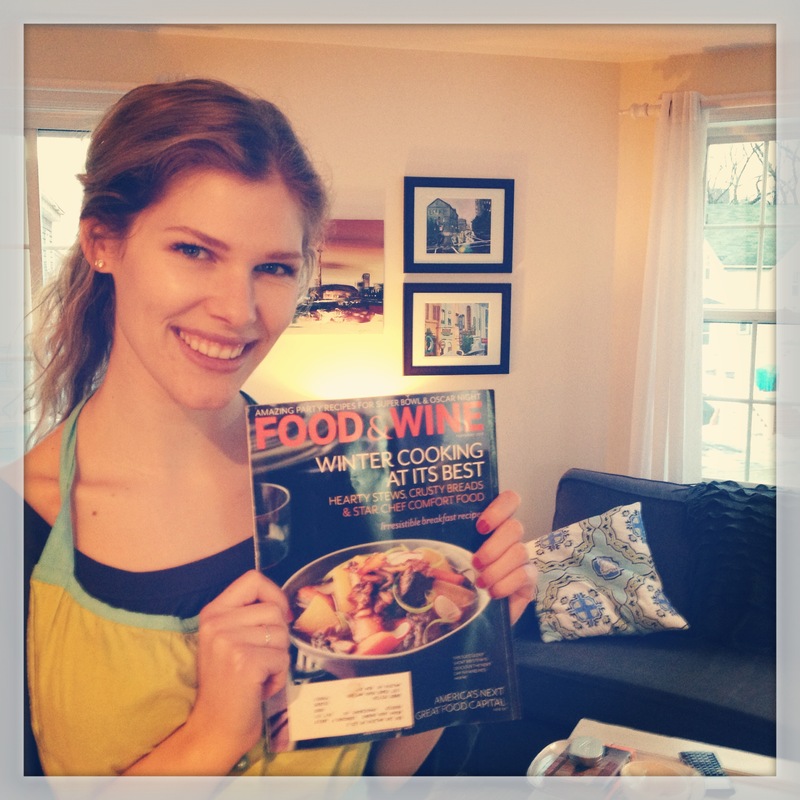 For those of you who don’t know, I have recently accepted a momentous challenge to make, eat, and write about the cover recipes of Food and Wine Magazine for every month of the 2013! So far its been going well and though this post may be a little late, it was worth the wait! 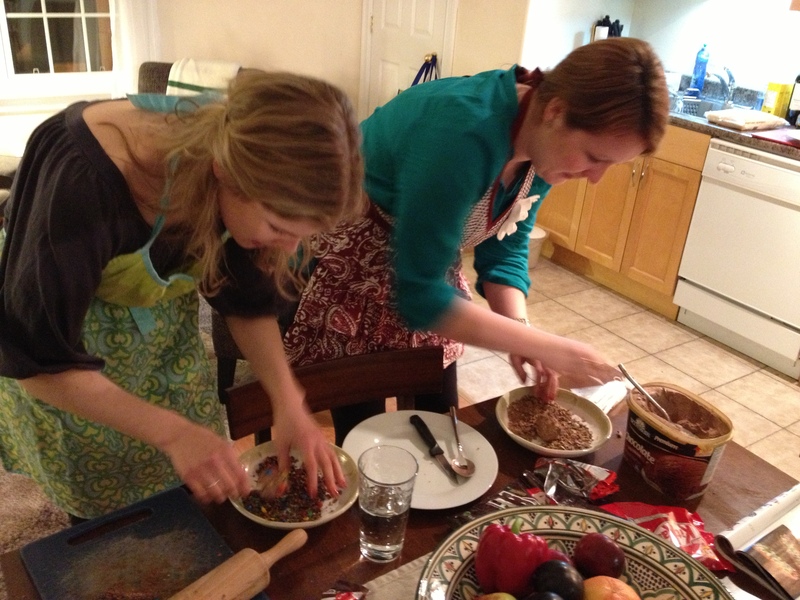 Things were a little different this month, as I decided to take my recipe researching on the road and cook February’s recipe with my partner in crime Erin at her lovely abode. Here she is in her living room, proudly displaying the cover recipe for February’s Food and Wine Magazine, doesn’t she look lovely? February’s recipe was Short Rib Stew with Caramalized Kimchi, and though I was excited about the idea of serving one simple dish this month as opposed to the plethora of plates that was last month, I was a little nervous about the time it would take to make it, and about some of the asian ingredients that I was not overly familiar with. I was however, very excited about the excuse to buy myself my very first cast-iron Dutch oven, which I proceeded to purchase very shortly after my February F&W arrived in the mail! First things first: the purchase of the ingredients is worth mentioning. On the big day I lugged my very heavy Dutch oven over to Erin’s apartment, and we set off down Quinpool to procure the necessary ingredients for the day. After successfully purchasing the short ribs, pears, garlic, and other more common ingredients, Erin and I felt triumphant as we correctly identified and located the daikon. The kimchi on the other hand was a different story. For some reason, I always thought that kimchi was a vegetable, and though I have eaten it in restaurants before, had always assumed it was a Korean vegetable similar to cabbage. It is not. While we were frantically searching the produce aisle for this fictional legume, a woman informed us that kimchi was not a vegetable, but in fact a pickled cabbage dish. D’OH! Later, after doing a little research, I found out that kimchi is a super popular Korean dish, and this spicy condiment is used on everything…oh well, you learn something new everyday! After a trip to the Taishan Asian Grocery on Quinpool to get the kimchi and sesame oil, Erin and I were ready to start cooking! The first order of business was to marinate the short ribs with a variety of ingredients, including soy sauce, garlic, and the Asian pear, which made the marinade smell amazing! 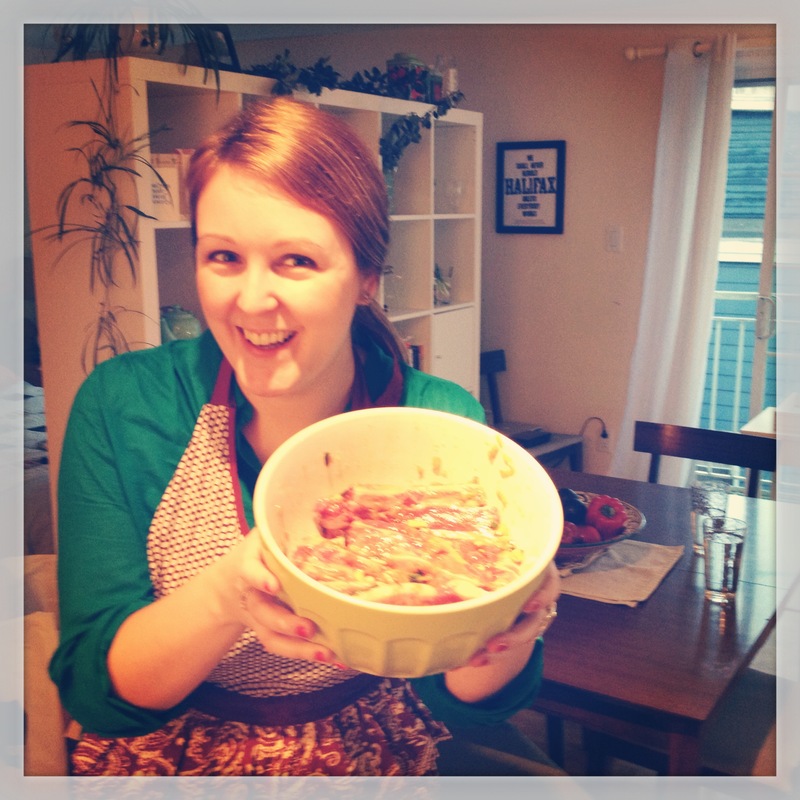 Me with the ribs marinating with Asian pear…they smelled great before they came anywhere near the stove! Once the ribs were nice and marinated, we had to brown them in the heated Dutch oven. I was a little nervous about the innaugral heating of my new Dutch oven, especially doing it on someone else’s stove, but it was easier to regulate the temperature of the pan than I thought, and boy, did those ribs smell amazing! The next step was to pour six cups of water with the ribs and some broth and let it simmer for about an hour. Easy. You would think so. About an hour into boiling the ribs, I realized that I had forgotten to put in the broth, but it didn’t seem to affect the final result. While the ribs were boiling, slowly turning themselves into yumminess, Erin and I peeled the vegetables for the stew. Erin and her boyfriend Matt share a lovely apartment, but they have about 2 square feet of counter space in their kitchen, which is definitely not conducive to peeling large amounts of vegetables. 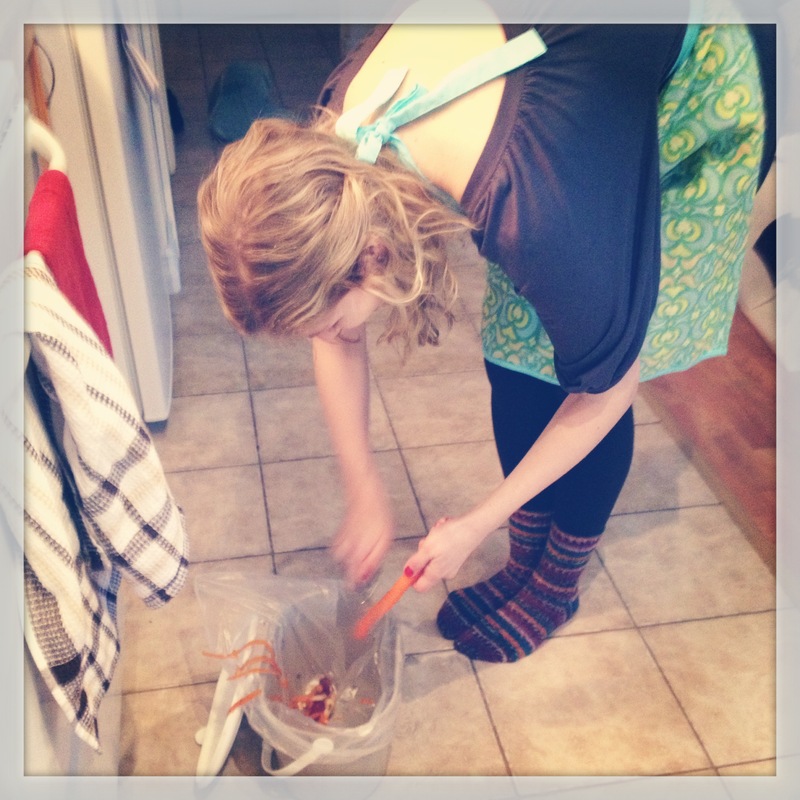 Here is poor Erin hunched over her compost bin peeling carrots, doesn’t look very comfortable, does it? Meanwhile, I was working away on the counter trying to conquer the daikon. For those readers who don’t know, daikon is an asian radish that is similar to a turnip, and they are giant, which means it is big and awkward to peel and dice. It was definitely a challenge. Once we added the vegetables to the ribs the stew was finally beginning to take shape! While it simmered atop the stove Erin and I made our chosen dessert for the evening, also from February’s F&W: Ice Cream Bon Bon Pops, found on page 52. The recipe consisted of your chosen ice cream flavour (chocolate in our case), rolled into balls, then rolling the balls in crushed candy bars and putting them on a stick. The pops were very easy to make as long as you were fast, and it didn’t take us long to knock out a couple for each dinner guest that evening. When the guests of the night had arrived (Adam and Matt), the apartment was filled with a lovely meaty aroma and it was almost time to eat! The last item on the cooking agenda was to caramelize the kimchi, which was also pretty easy, and was basically frying the kimchi with sesame oil in a skillet. To finish preparing the meal, we cooked some basmati rice, sliced some four cheese oval bread from Pete’s, and we were ready to eat! The meal turned out beautifully. Just look! 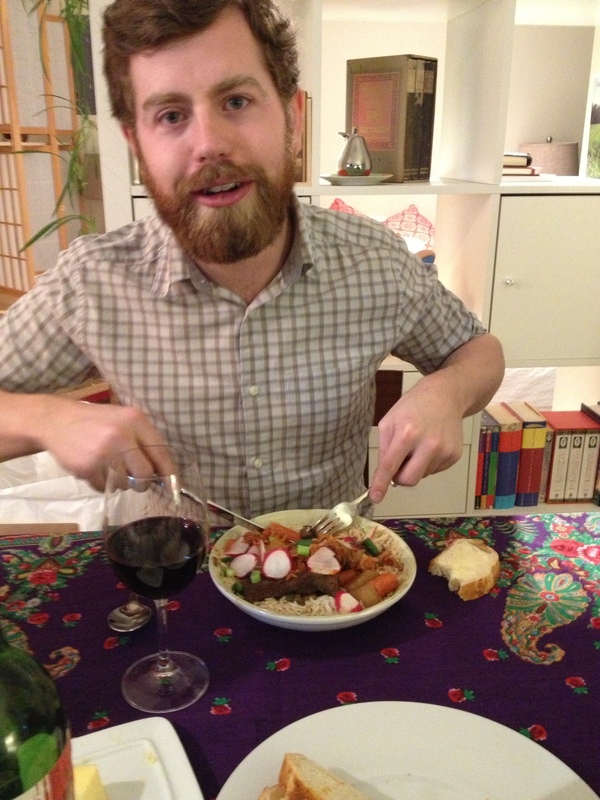 Everyone at the table loved the stew, Matt in particular, and we all raved about how good the dish had turned out. I was surprised at how much I liked the daikon. Normally, I am not a huge radish fan, sometimes I find their taste too harsh, but daikon is more like a sweeter, less corky version of turnip, and I will most definitely be using it in my curries from now on! 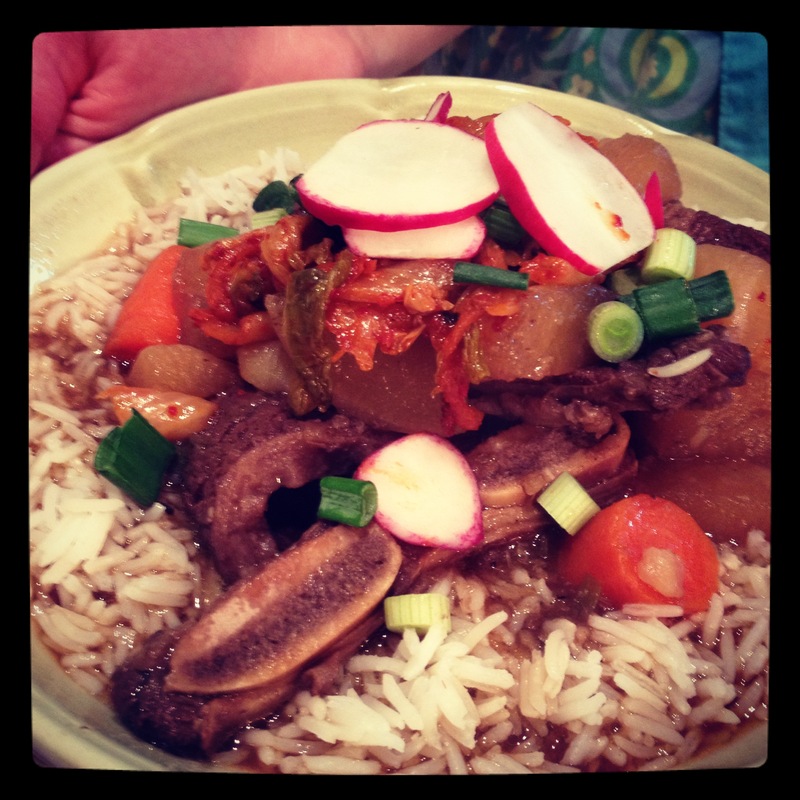 The kimchi was also a big hit with everyone, and it was the perfect garnish to a savoury and succulent stew. The short ribs turned out better than I thought they would, falling right off the bone and melting in our mouths. 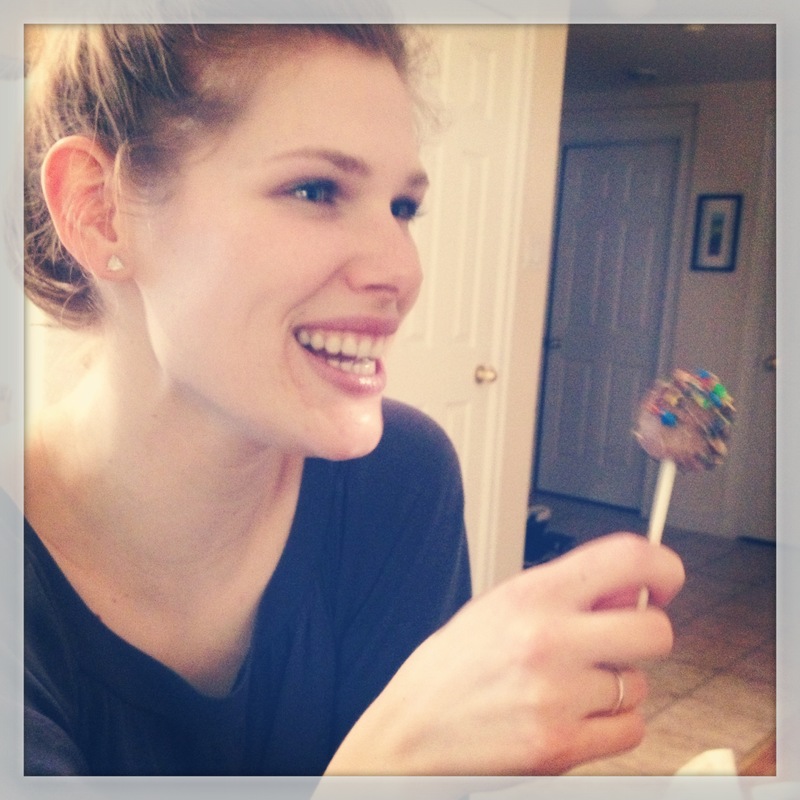 The Ice Cream Pops were also a big success. After being put back in the freezer after production, they came out cold and delicious, and super easy to eat. We chose M&Ms and Kit Kat bars to use as our toppings, but any kind of candy bar would do! Next time I want to try Skor bars! With my trusty F&W Wine Guide in hand, I set off to the liquor store to buy a red and a white wine to compliment the stew. Though they did not have some of the selections that I had chosen from my guide, I did find two wines that worked very well with the stew. The first was the Robert Mondavi Private Selection Cabernet Sauvignon ($19.99), which was a perfect choice. 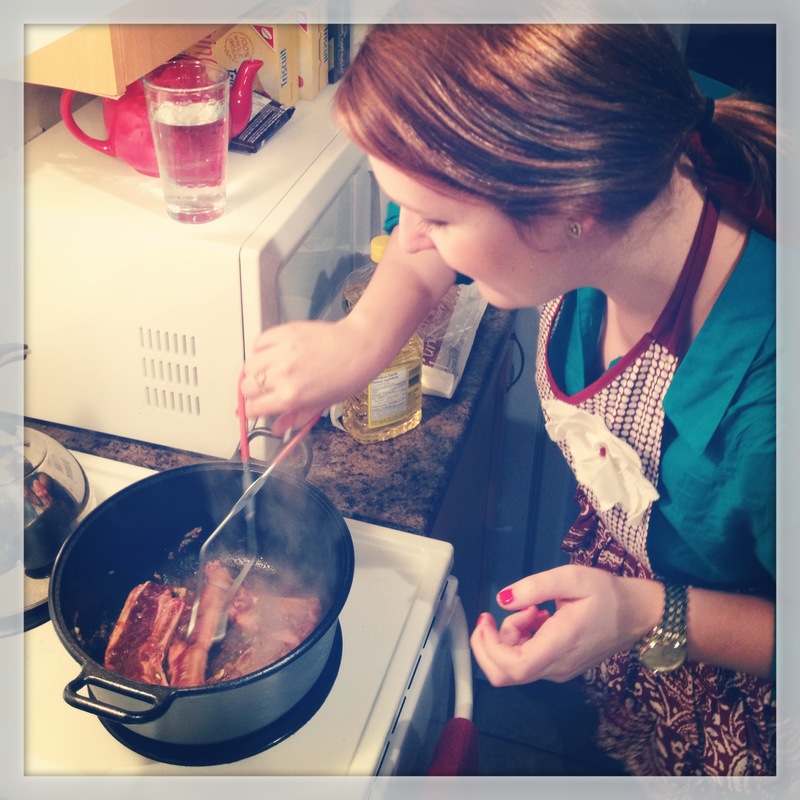 Cab Sauv is always good with red meat, and I knew that it would work awesomely with this dish. 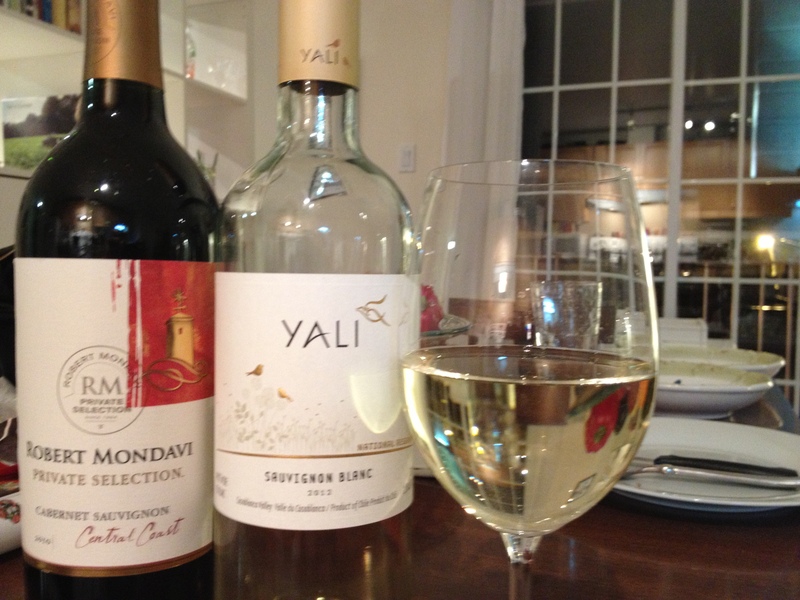 The other selection was the Yali Sauvignon Blanc from Chile ($14.99), and it was chosen because I thought its crispness would compliment the radish and kimchi in the dish. It did. Overall February was a very easy recipe to follow, and, despite my inaptitutde for shopping for asian groceries, I will most definitely be making this meal again. If you want to try out the recipes that we tried this month, or any other recipe from February’s F&W, check them out here at www.foodandwine.com/monthly/february-2013. I encourage anyone who has a Dutch oven (or wants an excuse to buy one) to try out this recipe and Explore. Eat. Repeat. any recipes that involve daikon or kimchi! Masitkke deuseyo!